We tend to buy a French newspaper to have access to a relatively reliable weather forecast showing the whole country. This way, we can avoid intentionally driving into storms. We bought one in Luché-Pringé and everything looks set fair at the moment. Fair, that is, from a tourist’s point of view. In addition to looking at the paper’s weather maps, we stumble our way through some of the articles in our school grade French and it seems that it is not only Angleterre that has “enjoyed” a much sunnier and drier than usual early spring this year. Much of France is suffering from a water shortage already and the season is only just starting. The summer proper is yet to come. I have always regarded the French as masters of water management. Many of France’s rivers are damned in many places creating artificial lakes and reservoirs. 15% of France’s electricity is generated using hydroelectric power driven by much of this water. 80% of France’s water electricity comes from nuclear power, the generators for which are cooled by much of this water. The French tactics may not be the best for certain downstream ecological issues, rather like America’s Hoover dam upsetting the ecology of the Colorado downstream, but they rarely run short of water. When they do, you know something unusual is happening. Not good! Failed crops and uncooled nuclear reactors are a very undesirable things. 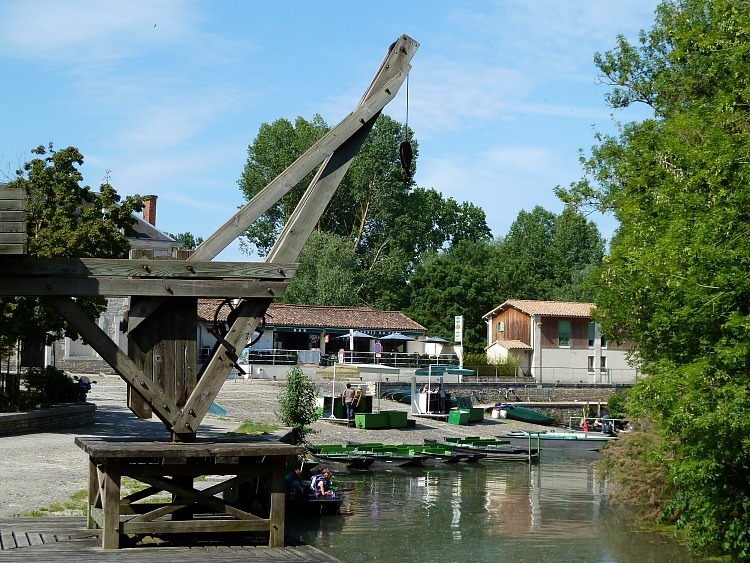 We reprogrammed Sally Satnav to “avoid tolls” and told her to leave a very wet Loir behind us and take us to Arçais in the Marais Poitevin where our friends mike and Linda live. “Oh look”, said Navigation Officer Francine, “she’s picked the same route I would have chosen”. Phew! One really doesn’t want two navigators arguing the toss. After a pleasant and cordial journey of about three hours, we arrived in the marais to be greeted by a very welcoming Mike. A marais is a marsh. 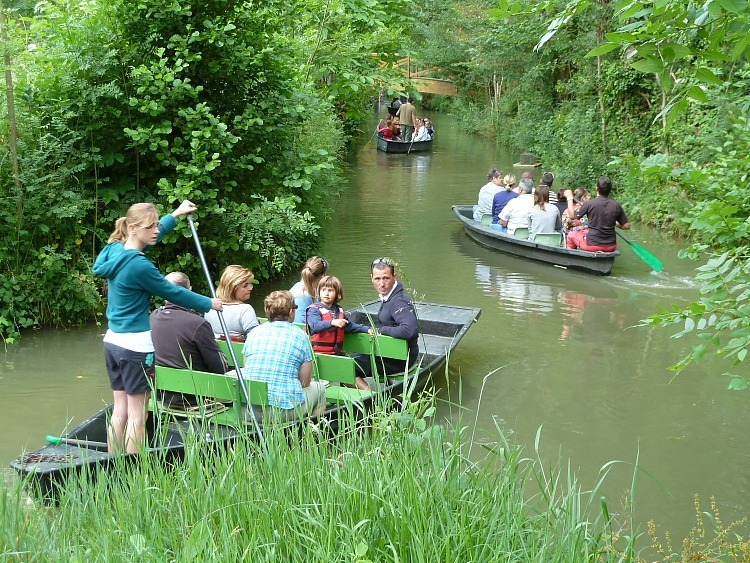 The Marais Poitevin is just inland from La Rochelle on the west coast and is an area drained by a network of canals spilling into the [river] Sèvre Niortaise. French gets unusually complex and precise at this point. Not content with just one word for canal, here the French have five words for canal depending upon the size of the waterway in question. Shortly after our arrival, Francine and I went wandering to refresh our memory of our surrounding marsh countryside. We are relatively frequent visitors to this neck of the French woods and this is the first time we’ve ever seen any of the smallest drainage channels completely dry. Quite clearly the water shortage is real. The country certainly needs some serious rain even if we tourists don’t. The main canals are still very wet as can be seen from this shot of the embarcadère in Arçais but the worrying, early signs of drought are there. Fortunately the locally valuable but seasonal work of punting bus loads of tourists around the marsh in barques can go on unhindered for the moment. OK I suspect you were hurried but 80% of Frances water is from Nuclear power could be an interesting concept. I wonder if you could argue that 100% of Frances water comes from nuclear power … just not the man made system….. I seem to be turning in to an old pedant. Sounds like you are having a lovely time in the marshes.